For as long as humankind has existed, so have psychics. Their far-reaching impact has influenced the world beyond measure. High priestesses were the most regarded and respected, and the Royals used to consult them regularly for guidance. Despite this, people have remained in fear of psychics throughout history. Regardless of how you feel, their force is undeniable. Take a look at how psychics have helped change the world throughout time. During the ancient times of Egypt, psychics were a main staple of the Royal court. It was a regular, everyday occurrence for them to consulted on many decisions, from the mundane to big. Psychics would give advice on everything from crops, government official choices, to battle strategies. People understood the value of them, and all psychics were treated with the utmost respect. Unfortunately with great responsibility would come great sacrifice. If they gave bad advice, they could risk going to jail or even prison! Once Judaism, Islam, and Christianity came into the picture, psychics began losing their position of power. No longer were they advisors to leaders, as priests and their clergymen began taking on the role of spiritual consultant. Religious bodies began seeing psychics as a threat to their power. With psychics around, it meant that they couldn’t control society like they wanted. The religious sect would start to tell people that psychics were the Devil’s work. This brought about a fever pitch, which ultimately leads to one of the biggest witch massacres in history…The Salem Witch Trials. 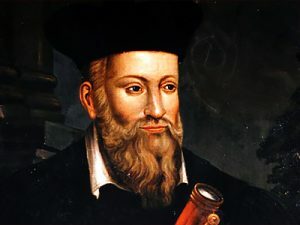 Michael de Nostredame, also known as Nostradamus, is one of the most popular psychics of all time. In the 1500s, he published many prophecies, which ultimately came true thousands of years later. Most had to deal with natural disasters like floods, earthquakes, and fires. Some even believe that he accurately predicted the catastrophe of 9/11. By the 1800s, a new movement began to take place in the U.K. and the United States called The Spiritual Movement. This movement proudly promoted psychic activity and encouraged people to consult mediums to communicate with the dead. The result of this movement sparked the New Age mindset, which is now wildly prevalent today. Many people don’t realize that psychics have been used on many occasions for scientific testing. Researchers like William McDougal and Joseph Banks Rhine conducted many psychic tests at Duke University. They even created their own ESP test by using a deck of cards. In the 1970s, psychic researcher Charles Honorton developed a psychic experiment of his own to test ESP. The method he used is still used today. Now, there’s a bit of resurgence with regards to psychics. You can’t really walk down the street without seeing a sign in the window, advertising for psychic services. The New Age section of any bookstore is also highly popular. There are all sorts of books being written about them, and some are even getting their own TV shows. Even the police department is beginning to see how valuable they truly are. Many are using them to help assist them in their crime-solving departments. Psychics are regularly used to help solve cases of missing children, dead body location, as well as locating crime offenders. Hollywood loves psychics. Supernatural, Medium and Ghost Whisperer have been on the air for years. But now, psychics are getting their own TV shows. The Long Island Medium is a reality show that is wildly successful. And of course, since these shows are about psychics, psychics are hired to help consult them on their scripts. Edward Cayce is one of the most popular psychic book authors in the world. Many of his books have helped trained aspiring psychics for decades. And although he has passed on, his books have been reprinted multiple times. But he is just one example. Other psychics have found massive success as book authors including John Edwards, Sylvia Brown and Shirley McClain. While nothing is ever set in stone, it’s safe to say that psychics will probably be around for a very long time. No matter what anyone says, psychics do help to illuminate the world. They are mysterious, awe-inspiring, and completely magical. Without them, the world would lose its sparkle. What do you think about psychics? Are you one? Is a psychic reading in your future?